The private garden at Buckingham Palace is best known as the setting for garden parties where the Queen and other members of the royal family meet people from all walks of life. The 2014 documentary The Queen’s Garden, which premieres on PBS this Sunday, provides a behind the scenes look at the royal gardeners preparing the grounds for thousands of guests. Trees are trimmed to allow for gentlemen walk under them in top hats, the lawn is carefully raked in case ladies in high heels decide to kick off their shoes and walk barefoot on the grass, and the pond is aerated to ensure that there are no foul smells interfering with enjoyment of the grounds. There’s also interesting film footage of past events on the lawn including the young Princess Elizabeth attending what may have been her very first garden party, hosted by her grandparents, King George V and Queen Mary and Edward VIII giving debutantes permission to flee from the pouring rain at an outdoor reception. 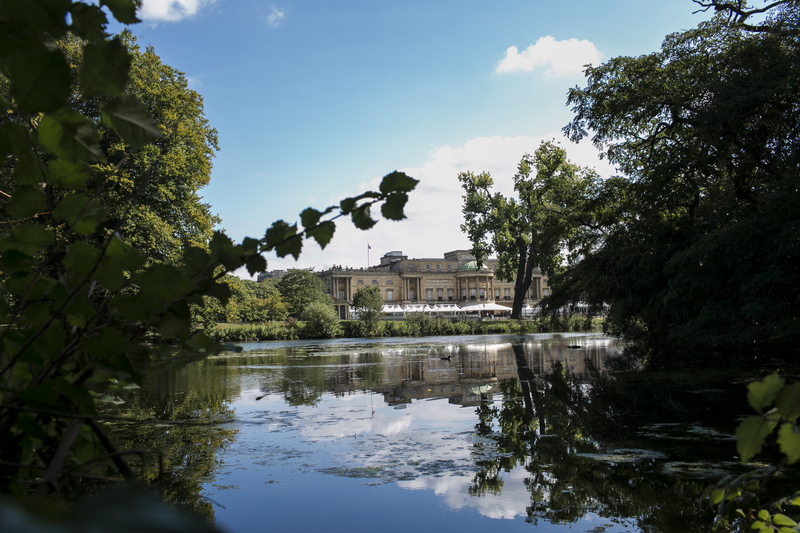 Although The Queen’s Garden provides a fresh perspective on garden parties past and present, the documentary also reveals there is more to the Buckingham Palace park than the famous lawn. Over the course of four seasons, the biodiversity of this urban oasis is revealed. In the heart of London, the Queen’s Garden provides a haven for rare plants and animals. In December, the filming of The Queen’s Garden attracted worldwide press attention because the film crew encountered hallucinogenic fungi – magic mushrooms – on the Buckingham Palace grounds. Although the distinctive red toadstools with white spots in the palace garden are the toxic variety from Alice in Wonderland instead of the better known little brown mushrooms, the news sparked curiosity about what other plants and animals made their home in the Queen’s garden. The documentary includes interviews with royal bee keepers and bird watchers who reveal the little known species live around Buckingham Palace. Plenty of royal history took place in the Queen’s garden as well. Henry VIII evicted Londoners from the grounds to create a deer park for his hunting parties. James I hoped to turn the garden into a silk production centre by planting mulberry trees to feed silkworms. King George III’s wife, Queen Charlotte, kept a zebra and an elephant in the garden before her menagerie was moved to the Tower of London and Queen Victoria’s husband, Prince Albert once fell through the ice while skating on the pond. 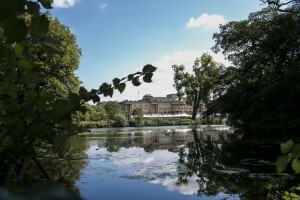 The Queen’s Garden combines history, science and party planning to provide a unique glimpse of the Buckingham Palace grounds, showing the hidden places beyond the lawn that even garden party guests rarely see. For more about royalty and gardening, see my previous post, Royals in the Garden that looks at royal personages who have lent their names to flowers -and the occasional vegetable! Will this show air again in the near future? Thanks Carolyn. Unfortunately it won’t let me play it as it has a restriction on the region. Only available in the U.S. I think it was very informative, but where were the Swans??? ?